Silenced activists, silenced official delegations: Who will speak for Palestinians? With over a 50 year stuggle under Israeli occuptation, Palestinians’ call for the right to self-determination is not something new. Systematic and gross human rights violations they face neither. They are daily realities for Palestinians; while their country is now being defined as “least desirable, the least inviting and the least livable place on earth1”. However their struggle for freedom is constant. In each and every occasion they call for an immediate end to occupation and blockade of the Gaza Strip and the ethnic cleansing in Jerusalem and other places in West Bank. They urge Israeli authorities to respect all United Nations resolutions and its obligations under international law recognizing their right to self-determination. Civil society activists and human rights defenders are at the forefront becoming a voice for these calls. They advocate for international solidarity and action as well. Palestine under occupation: Is 2030 Agenda for Development possible? Two years have passed since the decision by the 90th session of the Palestinian Council of Ministers on 19 February 2016, to form a national team to lead and coordinate national efforts to implement the United Nations 2030 Agenda for Sustainable Development in order to contribute to the dissemination of the Agenda, and to achieve the Sustainable Development Goals. However, the outcomes and results of this national team have not been realized, despite the fact that the government attempted to integrate the goals and targets into its national development strategies. The main obstacle to realizing these goals and targets is the colonial military occupation that continues to abolish all means of development in Palestine, in addition to ongoing land confiscation, continuous looting of Palestinians financial and natural resources, West Bank fragmentation due to settler expansion and the Gaza Strip blockade. UNCTAD’s latest study concludes that Palestinians have been denied the human right to development after half a century of occupation and appropriation of land and resources. The situation is shown in a number of alarming indicators. According to the Palestinian statistics bureau, almost one in three people (29.2 percent) were living below the poverty level in 2017. With 53 percent of individuals in Gaza Strip found to be poor in 2017, the poverty rate for Gaza Strip was more than four times higher than that of the West Bank, which was 13.9 percent, reflecting the catastrophic effect of the 10 year and ongoing blockade on the Palestinians. 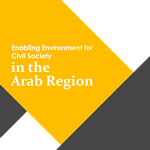 The Arab NGO Network for Development (ANND) launched a book on the enabling environment of civil society in the Arab region. The publication aims to present an overview of the current situation of civil society organizations in Tunisia, Egypt, Lebanon, Iraq, Syria, and Palestine. It uses several country-specific indicators regarding the establishment of civil society organizations and their success. The current conflicts raging in the Arab region constitutes a serious challenge, especially in lack of attention to laws regarding the work of civil associations, in addition to the shifts faced in funding. The publication highlights several legal challenges, especially those resulting from the lack of commitment to the principles of the separation of powers, as applied by democratic societies, as laws and regulations are often politicized. The book includes several recommendations to invigorate the work of civil society organizations in the regional, in order to consolidate the values of justice, equality, and sustainable development. Following 8 days involving 43 Voluntary National reviews (VNR) and 147 side events with 77 ministry-level participations and 2458 registered stakeholder representatives, the statistical outlook of the 2017 High-Level Political Forum on Sustainable Development Goals is quite promising. It is only the second review and just two years after the kick-off for the implementation of a universal agenda towards leaving no-one behind. Yet, time is marching on and there is a long way to go on the level of implementation. 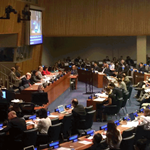 At the 2017 HLPF, Jordan became the third country from the Arab region to participate in the VNR process; following Egypt and Morocco in the 2016 review. The first words of Jordan’s national report made reference to the same issues: ‘the power of working together’ and taking into consideration ‘the urgent world issues’. The United Nations Special Rapporteur on the situation of human rights in the Palestinian territories occupied by Israel since 1967, Mr. Makarim Wibisono of Indonesia, has stressed the critical need for the international community to increase its protection of the Palestinian population. Mr. Wibisono, who has resigned because of Israeli non-cooperation with his task, while presenting his final report to the Human Rights Council, recalled the well-documented violations related to the Israeli occupation policies and practices in the Occupied Palestinian Territory (OPT), and appealed to the Government of Israel, as the occupying power, to take practical steps to implement protections under international law as it pertains to the Palestinian population living under occupation. During the 23rd Working Group session of the Universal Periodic Review the situation of human rights in Lebanon were reviewed by the UN member states. During the interactive dialogue several member states directed recommendations to Lebanese Delegation headed by Permanent Representative of Lebanon to UN Mission in Geneva Mrs. Najla Riachi Assaker on the issues of women’s rights, torture, migrant workers, establishment of a moratorium on the death penalty. Three and a half hour session provided the occasion for both national delegation representatives and the UN Member states to shed light on the ‘extraordinary challenges’ the country is facing, namely the Syrian crisis and the terrorism in the neighbourhood. Unfortunately as civil society groups engaged in the UPR process and working on issues of human rights and development, we believe that these challenges cannot be ‘excuses’ for non-implementation of recommendations accepted back in 2010 and in overall providing maximum available resources for ensuring the full enjoyment of human rights in the country. The Palestinian Non-governmental Organizations Network (PNGO) raised concerns and warned of a dangerous deterioration in the humanitarian situation in the Gaza Strip due to severe drop-long power cuts caused by the fuel outage. PNGO stated that power outage in the besieged Gaza Strip seriously affects basic life facilities in particular health,water, education and sanitation as well as vital sectors. PNGO demanded the international community and Arab and Palestinian parties as well to immediately carry on their responsibility to find real time and strategic solutions to the power cut offs in the Gaza Strip. The peoples’ uprisings in the Arab region presented a golden occasion for revisiting the European Neighborhood Policy (ENP) and particularly the partnership between the Arab countries and the European Union (EU). The Joint Communication of the High Representative and European Commission, “A New Response to a Changing Neighborhood, ” highlighted important lessons learnt but remained an exercise of self-assessment without the engagement of EU partners and relevant stakeholders (including civil society) for what are widely considered today as major historical changes in the Arab countries. For the fourth successive year, a delegation of human rights and development civil society organizations from the Arab region will be visiting the European institutions in Brussels between the 8th and the 12th of December 2014. The Arab delegation includes civil society representatives from Egypt, Jordan, Palestine, Morocco, Syria, Tunisia and Lebanon. This visit seeks to provide a platform for dialogue and exchange between civil society organizations from the Arab region and European policy makers at the Parliament and Commission around the EU’s support and involvement in the region.